Developed in Japan by Morihei Ueshiba (1883-1969) around 1925, Aikido is unique among the martial arts because, as suggested by its name, it emphasizes the use of blending and awareness rather than force and resistance. Aikido techniques rely on a calm mind, relaxed body and accurate positioning rather than strength. Aikido is a moving meditation and a healthful exercise, developing the power of mind and body working in harmony. Observe a class: We recommend coming by and watching a class to get a good idea of what goes on at Choshinkan Dojo. The best times to visit are Mondays and Wednesdays: those nights have the best mix of students and techniques, and it's the best time to talk with the instructor(s). You can watch all of the class, or just part of it; if your time is limited, you might want to arrive after 7:30 pm following the basic warm-ups. Take the introductory lessons: For people with no Aikido experience, we require a set of three one- hour introductory lessons. These one-on-0ne sessions are taught from 7:00 pm to 8:00 pm on Monday and Wednesday and can be scheduled at any time. The lessons cover etiquette, some basic rolling practice, and several simple techniques. After completion of the three lessons, you should be able to decide if Choshinkan Aikido is for you. 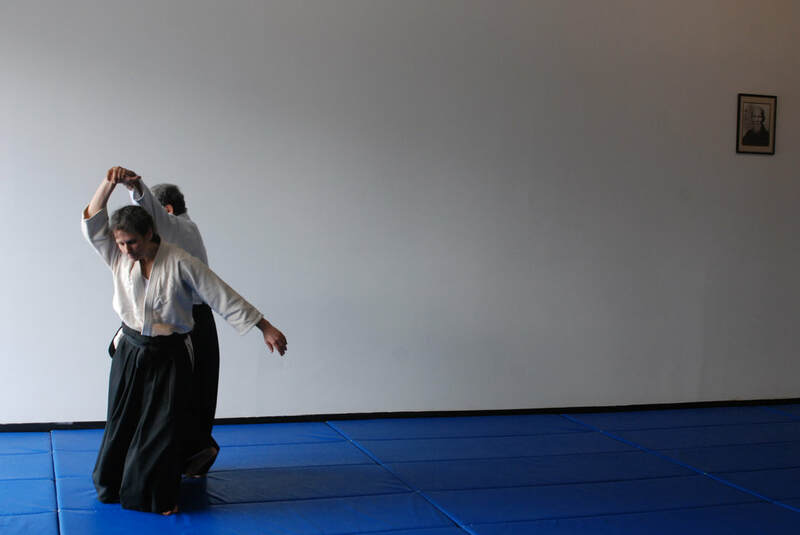 Prior experience: People with an Aikido background are welcome to join the class immediately; if you feel you need a refresher, we'd be glad to help. Join the dojo: After your introductory lessons, you are welcome to join the adult classes on Monday, Wednesday, and Saturday. We recommend attending at least two classes per week to make adequate progress. Rank demonstrations are scheduled quarterly and students are "tested" at the discretion of the instructors. Aikido at Choshinkan dojo is non-competitive and students earn rank by showing dedication, enthusiasm, and an understanding of Aikido, as well as progress towards mastering physical techniques. Pay your dues: We ask for a nominal registration fee and the first month's dues upon joining. Triangle Aikido has no contracts or mandatory payment commitments. Dues are due by the 10th of each month. We offer student, family, and law enforcement discounts. Uniforms are available for purchase at the dojo. Have fun! At Choshinkan dojo, we practice Aikido because Aikido is fun. We have a wonderful community of instructors and students who share a love of serious training coupled with laughter, friendship, and harmony. We strive to master the art of peace in the dojo and to bring it into our everyday lives. All classes are taught by Aikiki Hombu-certified instructors under the direction of Ned Danieley, 6th dan.